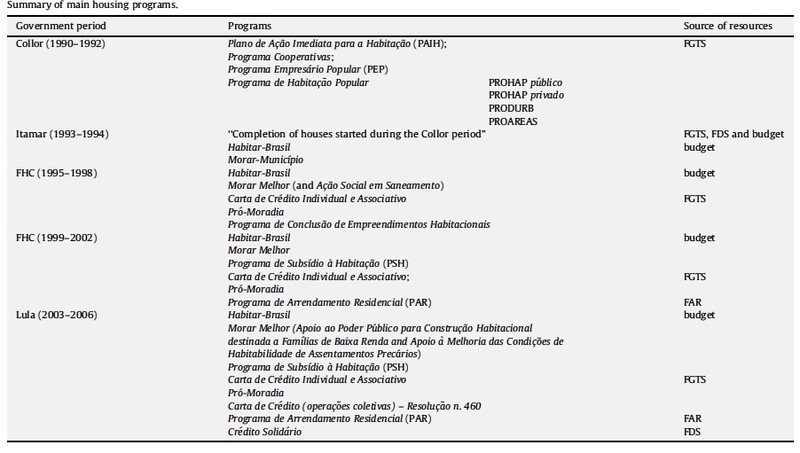 The trajectory of social housing policy in Brazil: From the National Housing Bank to the Ministry of the Cities | Baierle & Co. This paper discusses social housing policy in Brazil since the 1990s by analyzing government programs’ institutional arrangements, their sources of revenues and the formatting of related financial systems. The conclusion suggests that all these arrangements have not constituted a comprehensive housing policy with the clear aim of serving to enhance housing conditions in the country. Housing ‘policies’ since the 1990s – as proposed by Fernando Collor de Mello, Itamar Franco, Fernando Henrique Cardoso and Luis Ina ́cio Lula da Silva’s governments (in the latter case, despite much progress towards subsidized investment programs) – have sought to consolidate financial instruments in line with global markets, restructuring the way private interests operate within the system, a necessary however incomplete course of action. Different from rhetoric, this has resulted in failure as the more fundamental social results for the poor have not yet been achieved.